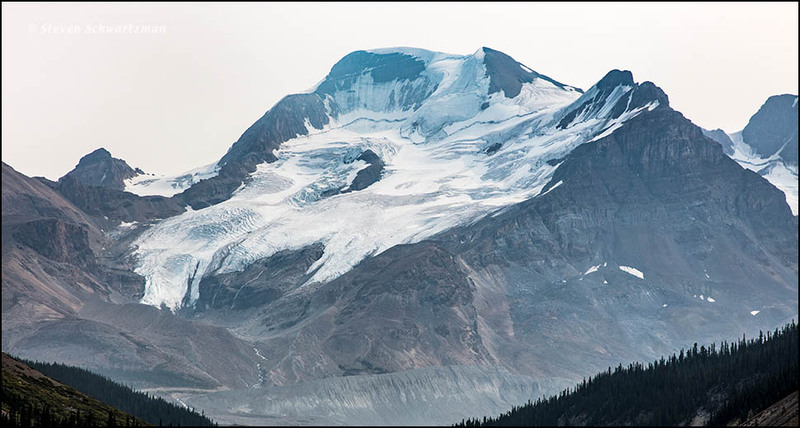 A year ago today we stopped along the Icefields Parkway to see the Athabasca Glacier in Jasper National Park, Alberta. Plenty of ice and snow remained on the adjacent mountains as well, even at this warmest time of the year. Below is a mostly downward look at how the moving Athabasca Glacier once scratched its way across a level expanse of upturned rock strata. 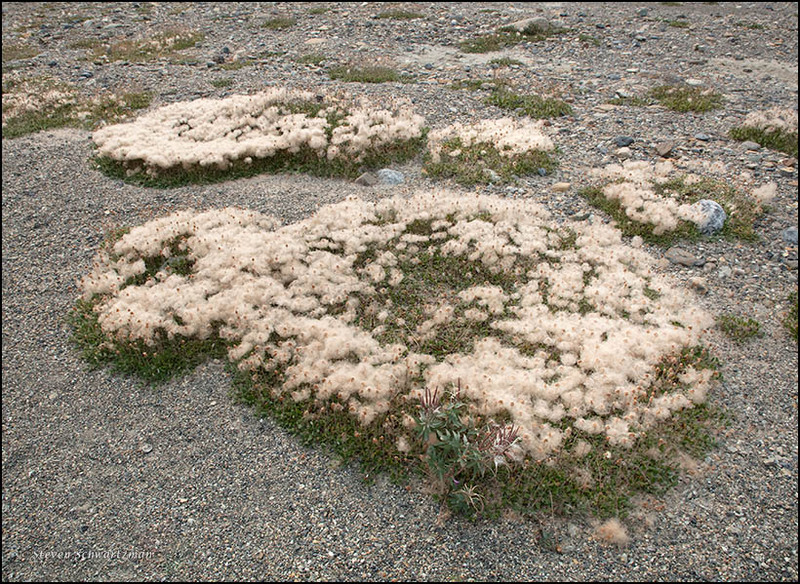 Near the scratched rocks I saw some low, fluffy mounds of what I take to be a species of Dryas, likely D. drummondii or D. octopetala. I learned that Dryas is in the rose family, and its seed heads are akin to those of its family mate Fallugia paradoxa, known as Apache plume. Wow. Love the scarifications. Had never seen them depicted in just this way. 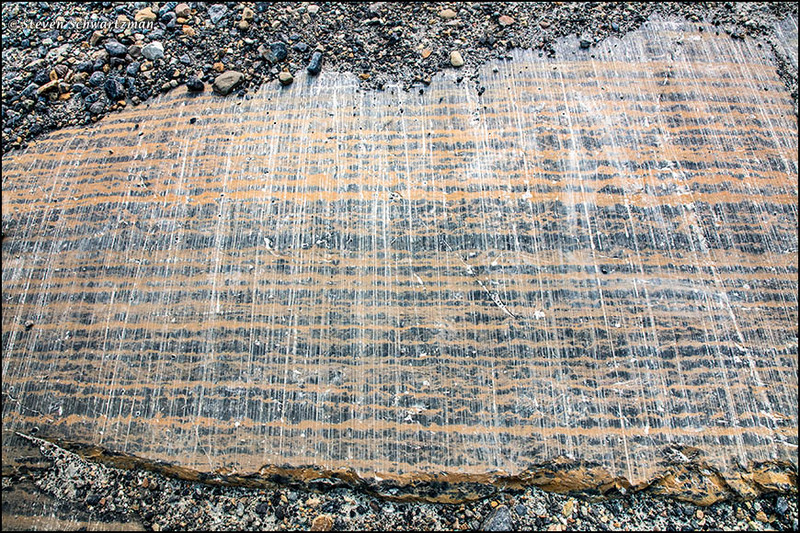 I’d never seen anything like it, either, with so many parallel scratches at a right angle to so many parallel strata. Boy that picture of the scarred rock is memorable – – looks like that glacier retreated reluctantly, hanging on by its nails. Oh wow! That scarred rock is outstanding. And how unusual are those “fluffy mounds”! You’ve captured some great shots of oddities with (to me) superlative beauty. The scratched rock has clearly grabbed people’s attention. I’d never seen anything like it, though I don’t know if it’s a familiar site to people who have a lot to do with glaciers. 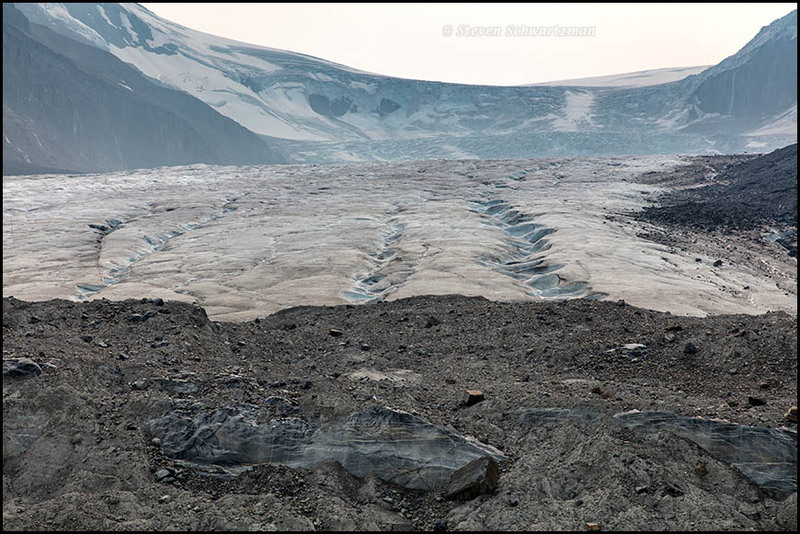 I saw and also photographed other glacial scratching in the area, but the example I showed in this post was the most striking. What made the ones in today’s picture different is how rounded the clumps were. One hypothesis is that the plants may have been growing in slight depressions that retained more moisture than the ground surrounding them. A carpet of ‘roses’ may one day replace the glacier. That would be an interesting sight, though I expect such a scenario is not possible outside my imagination. My imagination is working overtime. I hope it’s getting paid time and a half for the extra labor. It’s fascinating how closely the seed heads of the Dryas resemble those of Clematis drummondii, at least from a distance. As for a rose-like appearance, the D. octopetala certainly looks like our invasive Macartney rose. If it has the same habits, Gallivanta could have her carpet of roses. When I first saw the fluff of Apache plume some years ago I thought immediately of Clematis drummondii, and I had a similar reaction with the Dryas, just as you did. As for the flowers, I saw some pretty roses at Acadia National Park but I suspected they weren’t native; I was right. The force of the weight the glacier presses against that rock makes for some interesting patterns. Cool stuff. And in a very cool part of the continent, climate-wise. I’ve read that some glaciers were a mile thick, so you can imagine the force they exerted.